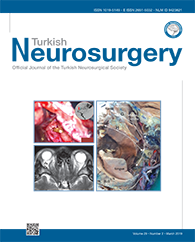 2Firat University, School of Medicine, Department of Radiology, Elazig, Turkey DOI : 10.5137/1019-5149.JTN.20326-17.1 AIM: To evaluate the preoperative and postoperative 6th month mean apparent diffusion coefficient (ADC) values of the cerebellar tonsils and bulbus in patients with Chiari Malformation Type I (CMI), and to compare the results with healthy controls. MATERIAL and METHODS: We included 15 patients with CMI who underwent suboccipital decompression, upper cervical laminectomy, and duraplasty surgery, and compared them with 10 healthy individuals. Three regions of interest were placed, one each in the cerebellar tonsils and one in the bulbus. The mean ADC values were measured separately in each region. RESULTS: Among the patients, mean ADC values were significantly decreased after surgery compared with before surgery. The mean ADC values before surgery were significantly higher for patients than for controls; however, although the mean ADC values were slightly higher after surgery for patients than for controls, the differences were not significant. Thus, after surgical intervention, ADC values in patients with CMI became close to those of normal individuals.